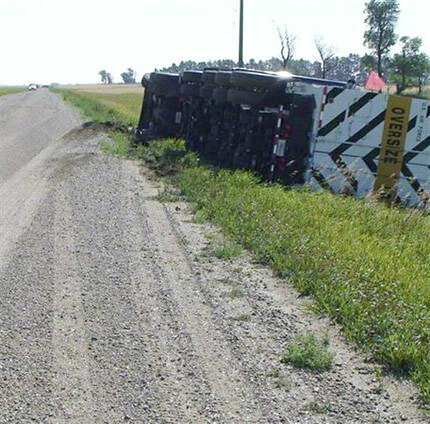 On July 31, 2008, in Bismarck, N.D., an Air Force truck carrying an ICBM Rocket Booster overturned in a ditch. The truck was on the way from Minot Air Force Base to a launch facility in Northwestern North Dakota, when it somehow “crashed” and overturned. The truck was carrying an unarmed booster rocket for a Minuteman III intercontinental ballistic missile. The truck and rocket, weighing 75,000 pounds were still lying in the ditch a few days later under armed guard and an Air Force spokeswoman, Maj. Laurie Arellano, said that it would be there for a few more days while the incident is in the “assessment phase” and the Air Force determines if it is stable. Local residents were not in the least bit worried about the missile. They are used to the military moving such things around and they trust them to be sure the missile is safe. Update: Eventually, it cost the military $5.6 million to recover the truck and missile booster from this accident. The truck remained on the side of the road along with the rocket for more than a week until they were removed. The Air Force placed blame for the indicent on the “driver and safety observer error”. I would point out a few things about this incident. If the military could be trusted, there wouldn’t be an ICBM rocket lying in a ditch. If you were the military spokesperson and they crashed an armed rocket booster, would you admit that it was armed, or would you report that it was unarmed? The only photo I could locate of this incident was apparently taken and released by the Air Force, so the details are limited.